If the times were very, very close at the head of the DP Class, they certainly weren’t in GT: Robin Liddell set a 1:20.274 on Wednesday morning in the #72 Tafel Racing Porsche 997, and that was almost a full second quicker than anything or anyone else. The next bunch were pretty tightly grouped though – nine-tenths covering the next seven cars. 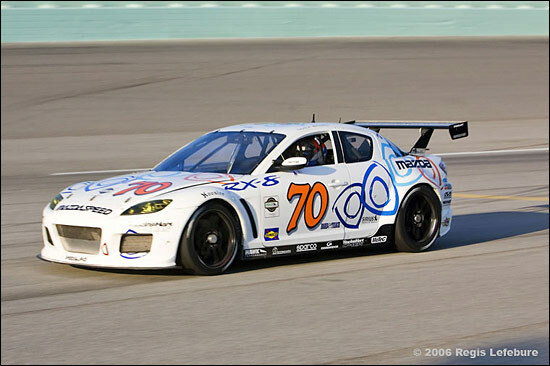 These seven comprised the two Farnbacher Loles Porsches, a Team Sahlen Porsche and the two SpeedSource Mazda RX-8s, bracketing the new Blackforest Mustang and the new Banner Racing Ponrtiac GXP.R. So Porsches first to fourth, in a category that is targeting the space(tube)frame ‘specials’. 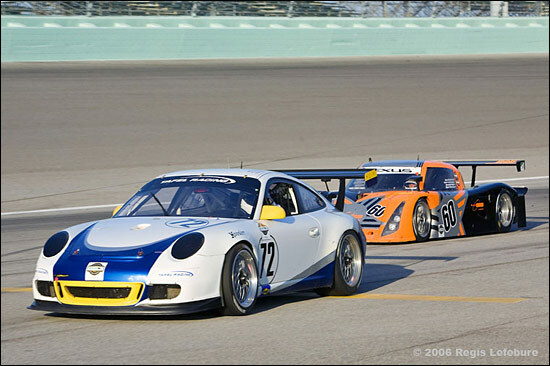 It will be interesting to see how Grand-Am copes with the initial disparity in performance between the 997s and the rest. Of course Tafel Racing’s main rivals in 2006, the TRG Pontiacs, aren’t running this year: 2006 was a mighty scrap between these two teams. For 2007, some outfits / new entries are going to have to step up into TRG’s shoes. “We’ve done quite a lot of development with Hoosier since the summer,” said fast man Robin Liddell, “and I’m reasonably happy with the 2007 tyres. There is a drop-off in grip, but the new tyres are bigger and offer more grip when new than the old tyres, so the drop-off seems greater. With a suggestion that the Farnbacher Loles 997s had a slight set-up issue, perhaps it was understandable that both their cars were a second slower than the Tafel example. No hard news available on the SpeedSource Mazdas, but they ran well – and noisily – to fifth and eighth fastest. The team’s best lap, a 1:21.704, was set on the first morning. Team owner Sylvain Tremblay has confirmed a full season programme with these cars. "Having spent 2006 contesting a limited schedule and focusing mainly on testing, we go into 2007 with a competitive car that can run at the front, at all the tracks. The team has spent considerable time making the car better and easier to work on. The package proved that it could win last year, now we just have to execute. With the full support of Mazda behind us, we are ready for a full assault on the GT championship." 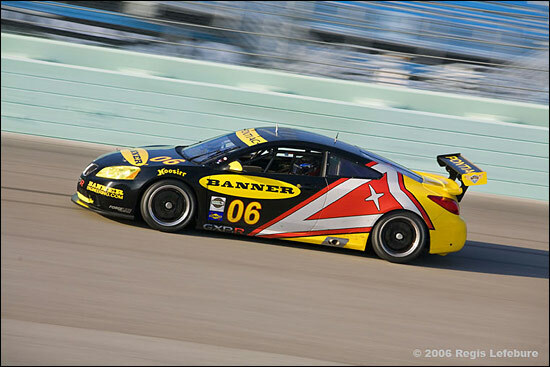 The Riley-built cars are welcome additions to the series – as should be the Team Howard Law Motorsports Infiniti. As mentioned already on dsc, Andy Wallace did all the running on Tuesday in the Crawford-built chassis, Terry Borcheller and Johnny Mowlem taking over on day two. “Terry drove on Wednesday morning, with me taking over after the lunch break,” said Johnny Mowlem. “On new rubber the grip initially feels quite good, but then the loss in grip is substantial after literally only two laps. At that point I was still learning the car and the track and so I actually did my fastest lap on lap 22 on the tyre, so if you look at the times from there, the car was actually running very reasonably indeed. Like all new packages, there are some issues that need to be addressed, but inherently Max Crawford has built a potential GT winner for Team HLM. "The only downside when you’re starting with a brand new, un-tested car, is that with the characteristic of the tyres losing grip so rapidly, in particular the rears, it makes it very difficult to evaluate significant set-up changes, such as suspension geometry and roll centres, unless you're putting on new tyres every 10 laps." “The Infiniti undoubtedly has a lot of potential. The times on Wednesday afternoon were at least a second slower than the morning, owing to the heat, and we were around 2.3 secs off the fastest time, so if you throw a new set of tyres at it, that realistically halves that deficit, which to my mind means that we're around a second off a top level Porsche after one test, which isn't too shabby. Obviously the trick will be to go testing and realise that potential, otherwise it's all speculation!" The tubeframe cars, with their low slung engines (and drivers), logically should be quick through the quick stuff. Another Porsche change for 2007 is that carbon roofs have been deemed ineligible, so Tafel Racing now has to re-fit steel roofs to its cars. “It really does seem that we are being penalized because we are doing a good job” continues Tony Dowe. “The real problem is that we have to race a very good production car against a very good real race car, very close to a DTM or DP, with GT bodywork. Once again I have to question - why? Because if all of the Porsche teams have to start from the same point, which we do, then what is the problem in other Porsche teams putting in the effort to get to the level we have reached? I thought that was part of what racing was about? “Nothing really wrong in just wanting to be there, but please don't penalize the teams that want to race to win. Did we ever complain about racing against TRG last year? No, we got stuck in and built better cars to give our drivers a chance to race. There are parallels here with the whole performance equalization conundrum, which is afflicting other series too. Tony Dowe’s view is a simple one: here are the rules, let’s develop the cars to the rules and go and race – and we shouldn’t be penalised if we do a better job than anyone else. Meanwhile, Robin Liddell is going rallying in Norfolk this weekend: as a new boy, he’s not expecting to win the Preston Road Rally – but you can be sure he’ll be as trying as hard as ever. It’s simply the nature of the ‘beast’. He's hard at it now, finishing off the final details to have his Peugeot 205 ready to go on Saturday night. So that’s as far as we can go with GT. There’s one more test before the Rolex 24 – but at this stage of the (2007) season, the Porsches are looking very strong, for now.